add some chicken broth and then drizzle in about half of the oil mixture. Lay the chicken pieces down next. Lay some potatoes and a cut up onion around the chicken. It is better if you cut these little potatoes in half so they can soak up some of the flavor better. I forgot to do that! Spoon the rest of the garlic mixture over the chicken and pop in the oven. I had the oven on at 425 degrees, but you can bake it at a lower temperature if needed. This took only 40 minutes. I had intended to leave the leg quarters in tact, but I got knife happy and cut them in two. But that way all the pieces were done at the same time. Normally, the breast gets done first and I will remove it from the oven before the dark meat. Notice how tasty this looks! 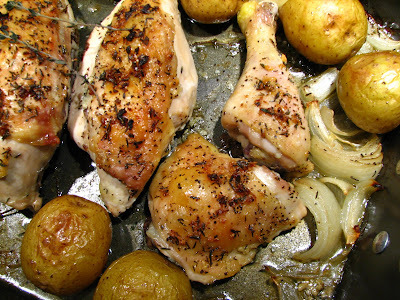 Golden chicken, buttery roasted potatoes with melt in your mouth onions, all drenched in garlic, lemon and Thyme! I served this with a nice crisp salad and some bread. Total comfort food in a very easy meal! You may of course, purchase the chicken already cut up. But, I prefer to cut up my own. I have always done that. Let's make this easy meal! In a small bowl, add about 3 Tbs. olive oil, 3 or more large cloves of minced or pressed garlic, and 2-3 tsp. dried Thyme (or other herbs) and mix. Let set for several hours, if desired, or use immediately. Add the juice of 1 lemon to the oil mixture. In a roasting pan, pour in about 3/4 cup of chicken broth and drizzle about half of the garlic mixture in the pan. Lay the chicken pieces into the broth and then spoon the remaining garlic and oil over the chicken. Sprinkle with kosher salt and pepper and pop in a preheated 425 degree oven. 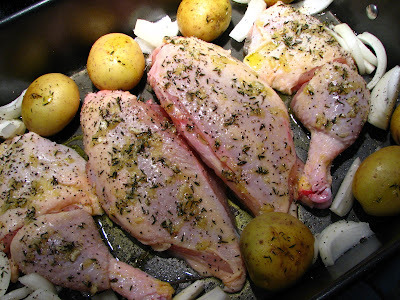 Bake until the juices of the chicken run clear when pierced with a fork. Mine was done in 40 minutes. The cooking time depends on several things. I used a 11x15 inch roasting pan and the chicken and potatoes were spread out a little. 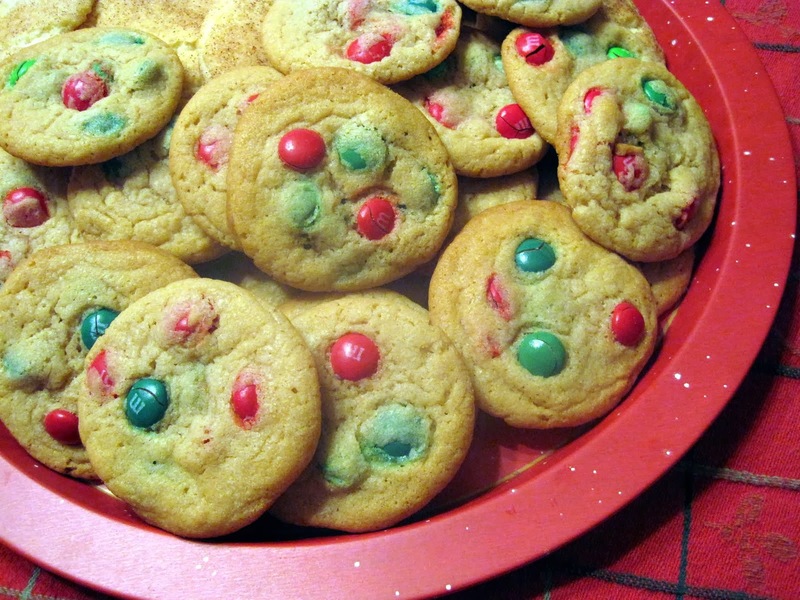 If it is crowded in the pan, it will take longer to bake. Also, you may bake this at a lower temp, if you have another dish in the oven with the chicken. This will also take longer to get done. About halfway through baking, check the pan juices and add more broth if the pan is getting dry. The chicken had a nice mellow garlic flavor with a hint of lemon. The next time, I will use a little more garlic. I sprinkled on a little more thyme after baking. This is a very easy, budget friendly, satisfying meal that you can change up by using other herbs, such as rosemary, or whatever you favorite is. Enjoy! 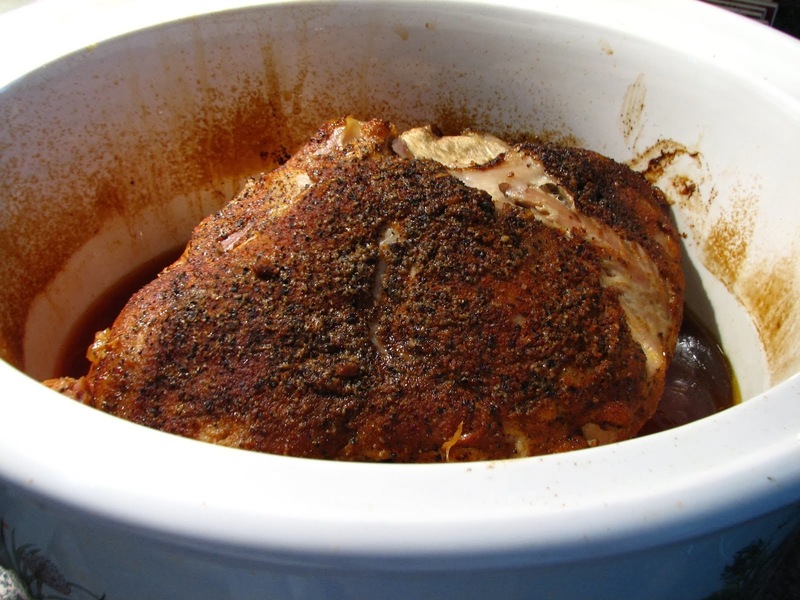 What are your favorite herbs to use with chicken? Let me know in the comments. This looks great, I have a chicken in the freezer right now that I'm trying to decide what to do with. I like to pair fresh sage with chicken, it's delicious. 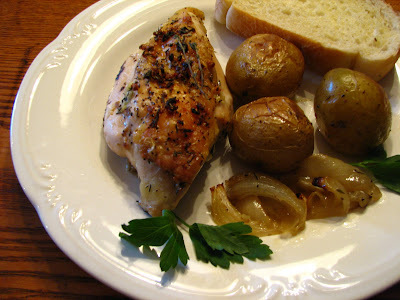 Lynda Your chicken looks great just love the thyme and potatoes. Looks great. Oh, yummy! I love roasted chicken and potatoes, and haven't had it for way toooo long! I totally agree that those gold potatoes are so delicious, and I love how your entire dish has that wonderful hint of lemon! YUM! It's great that you cut up your own chicken; I should do that. I also really, really like your roasting pan! I am on a mission to try more chicken dishes and this one looks awesome. I love how golden it gets! Looks delicious. I eats lots of chicken and those potatoes look fabulous!! 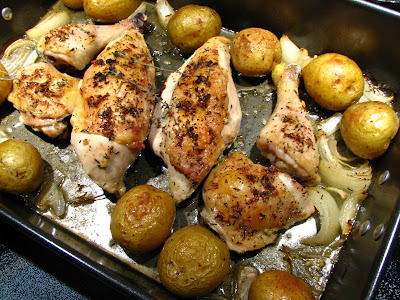 Roasted potatoes and chicken~a winning combo for sure. I haven't done this in ages. It's about time I did! 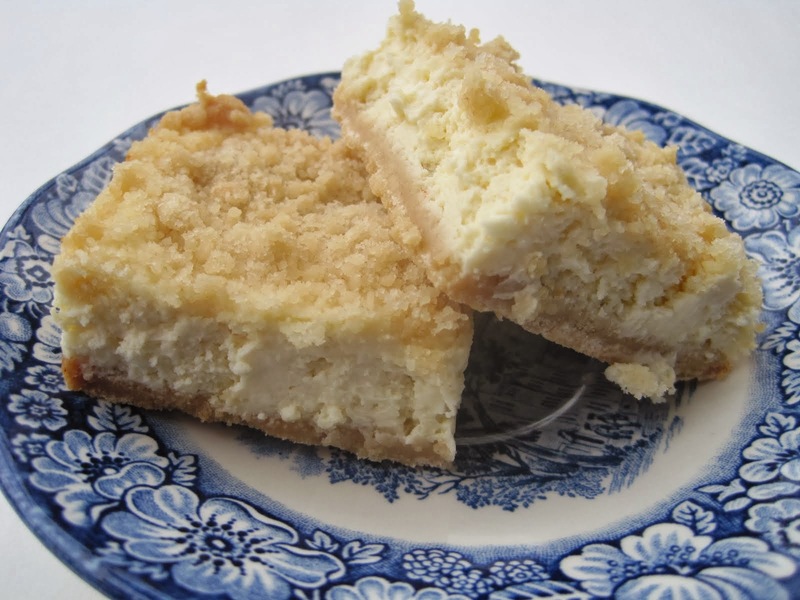 This is a nice, easy but delicious recipe. I make chicken this way, also, using fresh Greek Oregano and thyme sprigs from my herb garden. I love the little Yukon Gold potatoes and also the fingerlings. They're perfect for roasting. This looks simple but I just know it tasted fabulous. I make a similar dish with roasted chicken thighs & veggies. Yum!